In the standard model of particle physics, the Yukawa couplings encode the interaction between the fundamental fermion fields and the Higgs field, and thus, via the Higgs mechanism, the masses of the fermion field after electroweak symmetry breaking. 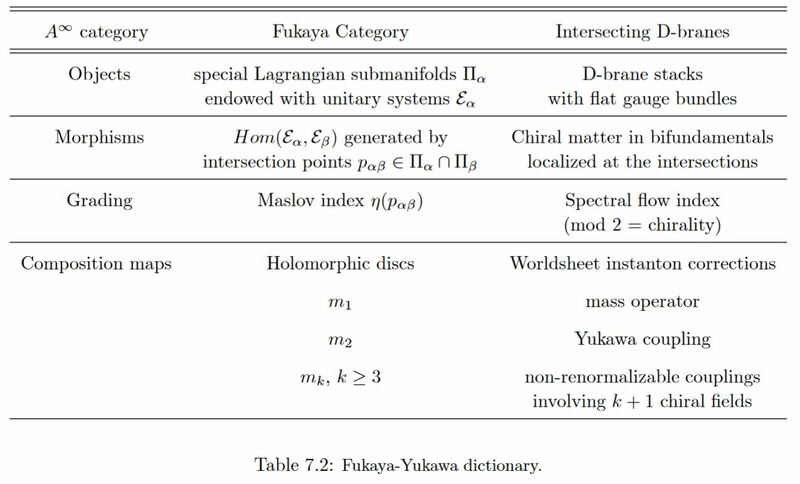 In intersecting D-brane models Yukawa couplings are encoded by worldsheet instantons of open strings stretching between the intersecting D-branes (see Marchesano 03, Section 7.5). Mathematically this is encoded by derived hom-spaces in a Fukaya category (see Marchesano 03, Section 7.5). Last revised on February 6, 2019 at 03:54:15. See the history of this page for a list of all contributions to it.